I like reading non-fiction books to learn about or get more information on topics that interest me. So I was happy to receive such a book last week. By the way, this meme is hosted by Marcia at The Printed Page. You should check out her blog and see what others have received and to play along. Homeschooling parents are under great pressure. Besides trying to balance teaching responsibilities and family life, they often face unrealistic expectations from relatives, churches, other homeschoolers, and society at large. Even parents considering homeschooling sense the need to be perfect. 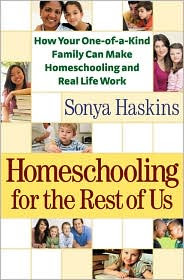 Sonya Haskins doesn't want any more families to give up on homeschooling. In this book she shares affirming stories and practical ideas from dozens of everyday families who successfully deal with cluttered schedules, academic struggles, sibling squabbles, and other real-life issues. Instead of learning a one-size-fits-all approach, readers will discover how to evaluate their own family's strengths and weaknesses and set their own goals for success. I received a novel in my box. You can see it here. I hope you get lots of useful information out of that book. This looks like an informative read! This book looks like it is full of good information. Have a great week!